It begins with the hunt. After receiving your first quest you'll head out into the fields for a few fights. 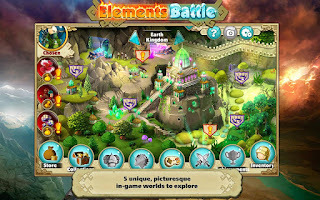 The pre-battle screen features sets of enemies displayed in a slot machine-style interface along with quests and extra goals up top. 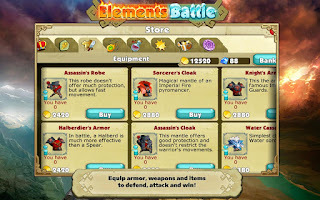 If the enemies you need to fight aren't shown, simply insert a token and give the lever a pull to randomize them. As soon as the right foe appears, tap the button and let the gem swapping begin. If you've played Bejeweled 3 or Puzzle Quest: Challenge of the Warlords you'll feel right at home in Elements Battle's combat screen. 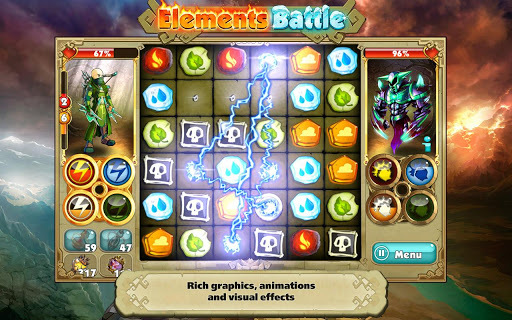 Your character is on the left, the enemy on the right, and a field of gems fills the center. You have five or six seconds to make as many matches as you can, swapping colored gems and other pieces to make matches of three or more that can damage the enemy or fill your element tokens. 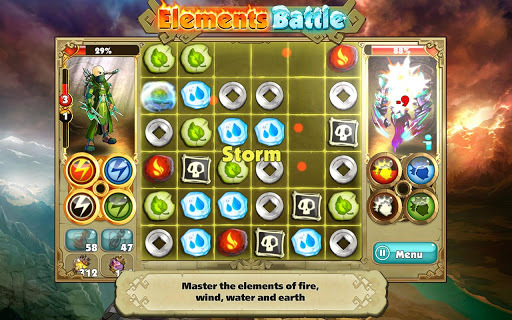 Buy and charge a red token, for example, and after matching several red gems you'll unleash a fire elemental blast. After your turn is up the enemy takes its turn, whittling down your hit points before handing the reins back to you. As soon as you run the foe's HP down to zero you win, gaining items and marking the creature off on your list of conquests. Not bad for a lowly student!